PREHISTORIK MAN - SNES - Super Nintendo - TESTED & WORKING! 3 product ratings - PREHISTORIK MAN - SNES - Super Nintendo - TESTED & WORKING! Trending at $26.95Trending price is based on prices over last 90 days. 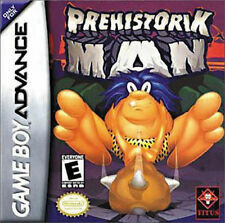 Prehistorik Man (Game Boy, 1996) H-SEAM SEALED! - ULTRA RARE! Prehistorik Man...Nintendo Game Boy Advance. Prehistorik Man (NINTENDO Game Boy Advance 2001) GBA SP DSLITE - TESTED!! Prehistorik Man (original nintendo Game Boy, 1996) H-SEAM SEALED! - ULTRA RARE! This page was last updated: 18-Apr 14:11. Number of bids and bid amounts may be slightly out of date. See each listing for international shipping options and costs.